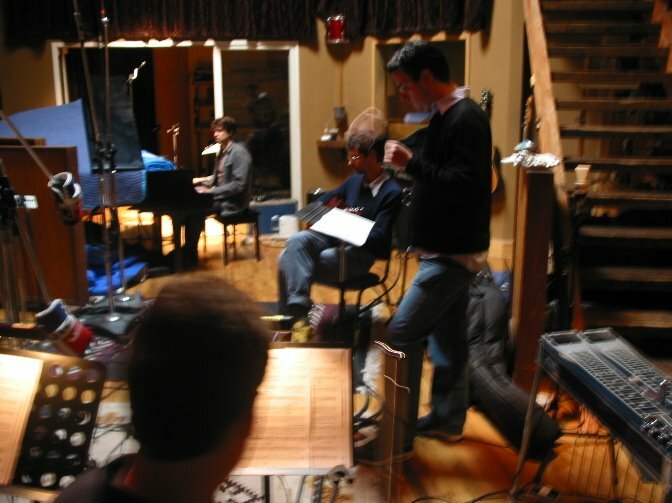 The picture is of a Hem recording session. 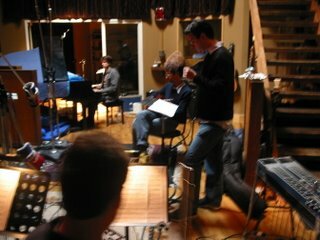 Greg Pliska is the arranger and conductor. 5/15 Monday night I'll be in LA at the Knitting Factory with Hem. 5/17 Wednesday night at 9:00 back in Red hook at Sunny's bar (253 Conover St) playing Western Swing with Smokey Hormel on my old Stringmaster. This is a very laid back perfect scene. 5/20 I'll be at The Mercury Lounge with Don Dilego . Well worth checking out. Shotgun Shack and then on into the abis with Sean Kershaw till 1:00. Free sausages ! Cheap beer ! Drunk dancing people ! Whoo Hooo ! 5/23 The Mood Illusion strikes again at The Lakeside Lounge ! My evolving into who knows what little band. Samoa the Joe Walsh of lower east side art music may sing a few with us. 5/24 Another weds playing western swing with Smokey at Sunny's. 5/29 I'm off on a short tour with Hem. I bought a pickup making business !